When Does a Cold Stop Being Contagious? Dealing with a cold is never easy, as the symptoms can cause some serious discomfort. Your head may feel stuffed up and your throat will be extremely sore. It is also common to have severe body aches. Your body needs to time to heal itself, so you need to take rest. However, you may also want to consider staying at home because you should protect your coworkers who would never want to share your germs. Fever, sneezing, and a cough usually indicate that you are contagious, but sometimes, you are still contagious when you no longer have these symptoms. How Long Is a Cold Contagious? Well, you are contagious even before you experience any symptoms. You could be contagious a couple of days before you notice your first symptoms and you may no longer be contagious after 2 weeks of your first exposure to the virus. It means that sometimes you think you are feeling better, so it is fine to go back to school or work, but you may still be contagious. You spread germs every time you cough or sneeze because of a respiratory infection. Interestingly, you can spread those virus- or bacteria-filled particles up to 6 feet. Moreover, these germs can stick to the surfaces you touch and infect others when they touch the same surface. Certain flu and cold viruses can survive on surfaces, including doorknobs, countertops, and phones for more than 24 hours. Therefore, it is important to take some measures to ensure you do not end up infecting others. It is important to wash your hands often using soap and warm water and ask others around you to do the same to protect them. Moreover, you should not cough or sneeze into your hands; instead, you should do it into your elbow. If you really have to go back to work, think about wearing a respiratory mask to protect others. 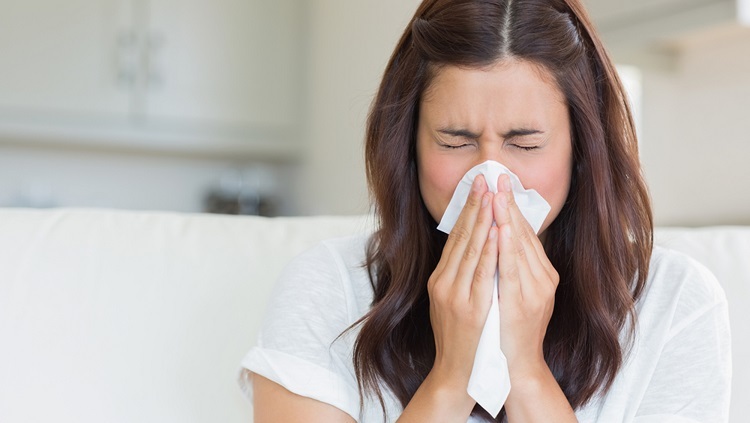 Be sure to cover your nose and mouth every time you sneeze or cough. It is better to keep a tissue with you all the time. Use the elbow of a sleeve in case you do not have any tissue available. It is better to discard the tissue immediately after use. You should consider using a new tissue every time you sneeze or cough because it will limit contact with the virus. Be sure to wash your hands frequently, especially after using your tissues. It is also important to avoid touching different surfaces. Do not touch public items like door handles and telephones to protect others. You can certainly take some steps to keep others from becoming infected, but it is always better to stay at home until you are no longer contagious. Taking rest will also help you recover quickly. You have to pay attention to your symptoms to decide if you should stay home or you are ready to resume work. It is usually fine to go back to work when you have a stuffy nose and a tickle on the back of your throat. These are allergy symptoms and are usually not contagious. However, you should not socialize with others when you are sneezing and coughing and feeling miserable. While at home, you should take plenty of rest and drink fluids to help recover quickly. Even when your fever and other symptoms have resolved, you should still stay home for at least 24 hours. This will ensure that you do not end up spreading the virus to others. How Do You Know If You Are No Longer Contagious? How long is a cold contagious? It depends on how long your cold lasts. You usually do not need any medical intervention for a cold, but you may have to deal with those symptoms for at least a week or so. Cough may last longer, but after a week, the cough is usually not contagious. You are no longer contagious and are cured of cold when you do not have any cold symptoms and signs. Take plenty of rest and drink non-caffeinated fluids to keep you hydrated. Take an OTC cold remedy to deal with your cough and fever. Be sure to take these drugs only when you have certain symptoms. Try decongestant nasal sprays if you have nasal congestion. It is important to avoid using such sprays for more than three days. Also, keep in mind that nasal decongestants can cause a rapid heartbeat and lead to a spike in your blood pressure. Therefore, you should talk to your doctor first if you already have an irregular heart rhythm, high blood pressure, or heart disease. Take antihistamines to deal with your stuffy nose. Just keep in mind that some antihistamines such as Benadryl can cause drowsiness. Can MRSA Be Cured Completely?